Long ago, a king called Conor MacNessa had warriors called the Red Branch Knights. He trained them to be strong men. King Conor also had a nephew called Setanta who wanted to be a Red Branch Knight. From a very early age he showed superhuman qualities of wisdom, warfare, magic and poetry. One night he said to his mother, “I want to be a Red Branch Knight.” But she said he was too young. Setanta was a happy child who played the game of hurling [the national sport of Ireland – like lacrosse or field hockey] with his friends. His team always won. When Setanta was ten he said to his father, “I want to join the Red Branch Knights.” His father said he was still too young. So he stayed on milking cows, carrying water to his house and chopping wood. One night a man came to the house to tell stories. He told lots about King Conor and his knights. 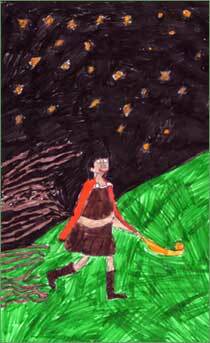 That night, while everyone was asleep, Setanta got his hurling stick and ball and left for King Conor’s castle. It was a long trip but when he got there, a hurling match was on. Setanta joined in and the other boys did not like it because he was such a good hurler. He went to meet King Conor and King Conor said he could stay. Later that night he set off. It was a long trip. He got to the fort and found a wolfhound guarding the fort. He hit the ball and killed Culain’s hound. The man heard the dog’s cry and ran out. He said, “I am sorry to see my dog go but glad you are okay. But who is going to guard my house now?” “I’ll be your guard dog until you can replace the one I killed. I’ll be the “Hound of Culain” [“CuChulain”],” said Setanta. So that’s how Cuchulainn got his name. Soon he became the best guard of all and joined the knights. He was the best Red Branch Knight ever.